Gold! The very word can cause the heart to flutter. News of discoveries of this precious metal has been enough to cause men to cross continents or oceans to seek their fortune. Little wonder, then, that Japan often kept the existence and location of its gold mines a closely guarded secret. 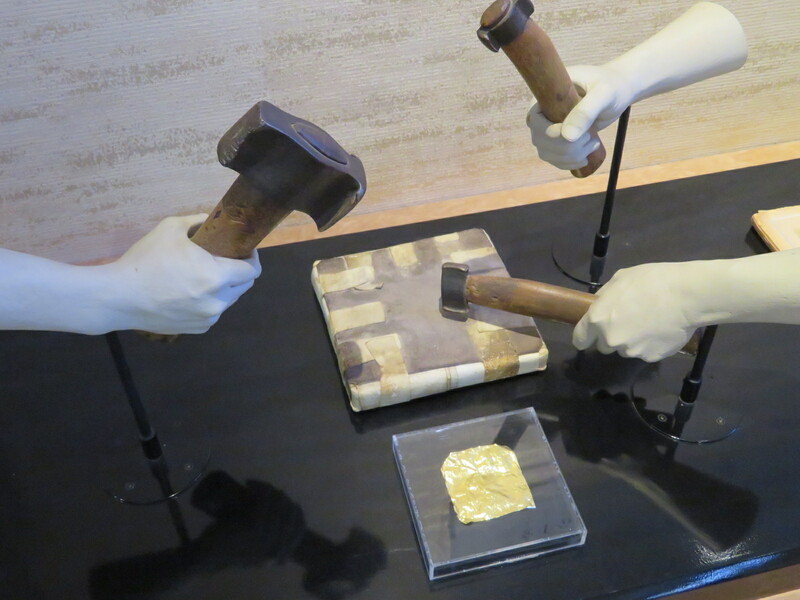 For in Japan, gold has long been among the most popular precious metals. Symbolizing wealth and prestige, gold has historically been used as a medium of exchange, and also to decorate artwork, garments, homes and religious items. Sixteenth-century warlord, Toyotomi Hideyoshi, even had a portable gilded tea room that he would use to impress guests. The tiny town of Toi, on the west side of the Izu Peninsula, is home to the second most productive gold mine in Japan. Although mining ceased in 1965, part of the mine is open for self-guided tours. Displays inside the mine and at the mine's museum help visitors understand how the precious metal was extracted and processed. There is also a building with troughs of hot spring water where visitors can actually pan for gold themselves. From now through Feb 4, 2018, between 6:30 p.m. and 9 p.m., there is the added attraction on the grounds of the Toi Gold Mine of an evening light-up of the early blooming cherry blossoms of this area. There are numerous locations on the Izu Peninsula where gold has been found, but apparently it was first discovered in Toi, perhaps as early as 1370. Mining was on a very small scale for the first 200 years. It was Tokugawa Ieyasu who sponsored large scale mining from 1601 and during the ensuing Edo Period Toi was a busy and prosperous place. All told, more than 100 kilometers of tunnels honeycombed the Toi hills, following seams of gold. More than 40 tons of gold was extracted. Gold mining is not without its tragedies. In December 1854, a M8.4 earthquake offshore caused a tsunami that flooded many of the mines. Lives were lost. After that, some mines were sealed up and even forgotten, while others continued production. 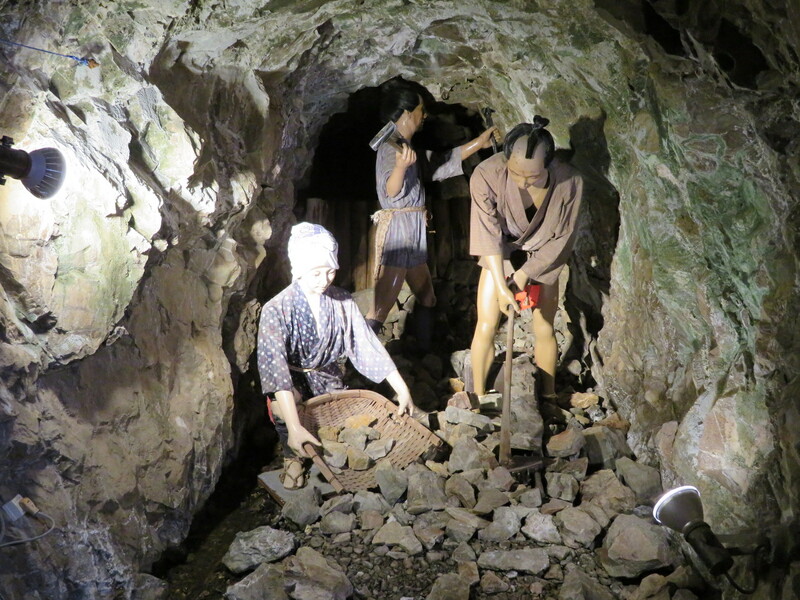 At the Toi Gold Mine, visitors can walk through about 100 meters of mine tunnels, with life-sized mannequins -- dressed as Edo Period miners -- placed throughout to demonstrate how the mine worked. 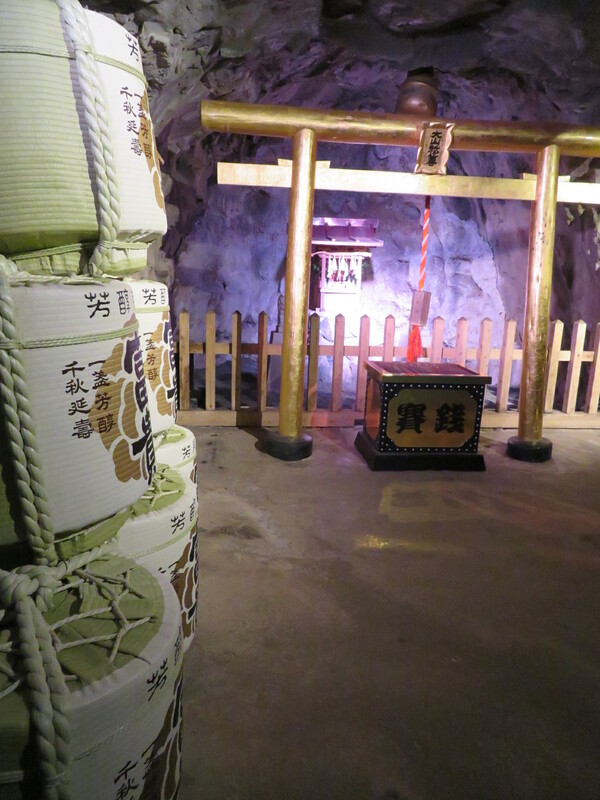 Not far inside the mine entrance is a Shinto shrine to the god of mining, where miners would offer prayers before commencing their work. There is also a pool of water fed by a hot spring -- dip your finger in the water for good fortune! Although you may derive fortune from this, when the mining went below the water table, the tunnels had to be constantly bailed out by some poor unfortunate. 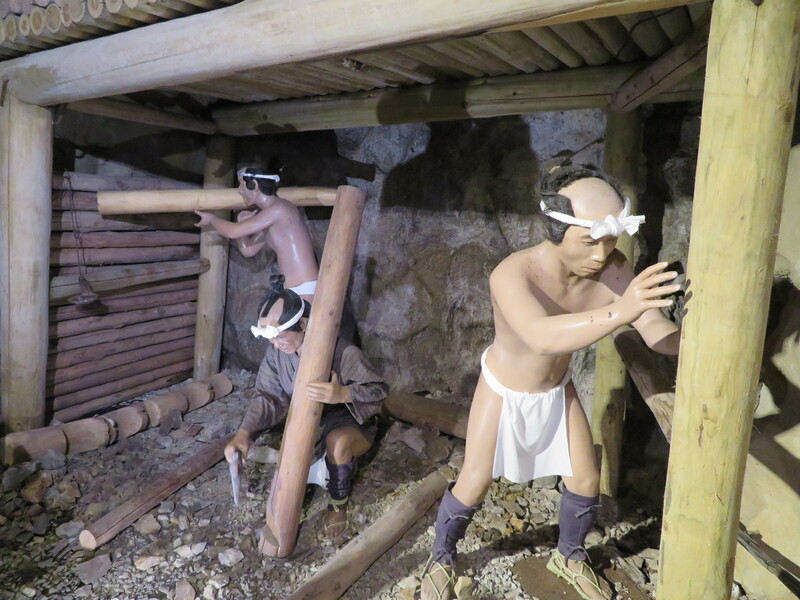 Other displays show how the tunnels were shored up with wooden supports to prevent cave ins. As the tunnels became quite long and were dug up to 180 meters deep, ventilation became a problem. Another display demonstrates how special fans were used to ensure a suitable air supply and prevent the miners from blacking out. Still another display shows how hot springs inside the tunnels provided miners with bathing facilities after their shift. Today's Toi is best known for its curative hot springs. Those miners were surely grateful to have at least this bit of comfort to what looks to have been a very hard life. Inside the mine museum are diaramas showing the smelting process whereby the gold was extracted from the rock in which it was embedded. Apparently, one ton of rock would produce anywhere from 5 to 30 grams of gold. 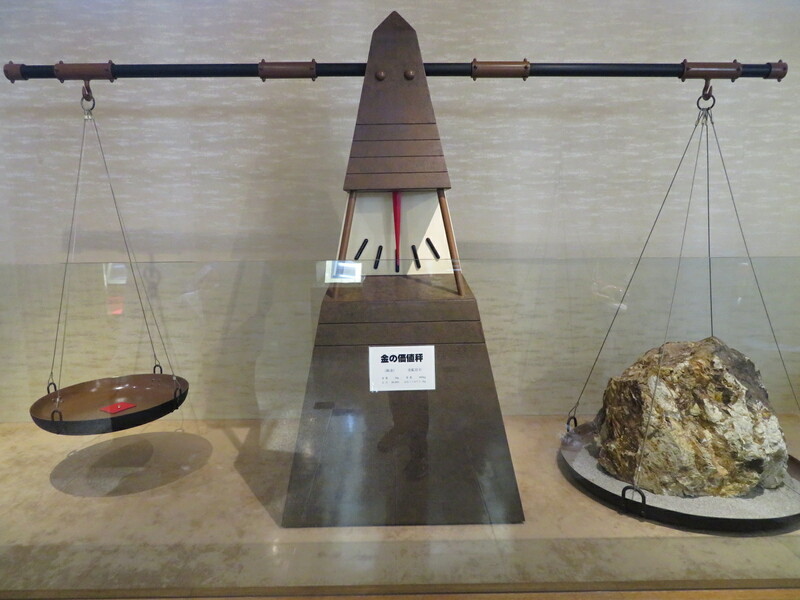 There are also displays of various types of rock -- enough to soothe the heart of any ardent geologist -- as well as Edo Period mining tools and how to produce gold leaf. A small scale replica of an Edo Period sailing ship demonstrates transport during the pinnacle of the mine's production. Because of Toi's remote location, surrounded by mountains, ships were used to bring in supplies and carry out gold. One might also think a ship would be more secure against theft than land transportation, but apparently the waters around Toi have a long history of piracy, too. There is rumored to be a pirate cave in a nearby headland. The museum is also home to a 250-kilogram gold bar, the world's largest, and lots of other examples of "things made of gold." If you've ever thought you'd like to pan for gold, here is your chance. For 720 yen, you can pan in one of several troughs of water -- supposedly each from a different river in Izu and seeded with 24 karat placer gold -- and keep whatever you manage to collect within 30 minutes. It's actually much harder than it looks. You swirl the water out slowly, seeing only mud and more mud and thinking there's nothing there. And then suddenly that little glint reveals itself! A most exciting moment! And what visit to a gold mine would be complete without some soft serve ice cream with gold leaf on top? While the Toi Gold Mine is the main attraction of Toi's gold mining history, perhaps a more interesting spot is the Tensho Gold Mine that is about 350 meters south of the Toi Gold Mine on Highway 136. This mine is one of those that was sealed up and forgotten after the 1854 tsunami, only to be rediscovered over a century later. The narrow tunnel is not long, but descends into the mountain, giving visitors a more authentic sense of what working in a mine must have been like. One interesting feature here is the inverted stair step shape of the ceiling, which apparently aided ventilation, a perennial problem. It is said that the Egyptian pyramids used the same shape. At the base of the mountain, between the road and the mine's entrance, is a nicely preserved example of an Edo Period smelter, too. You need to apply at the smelter site for permission to enter the mine. Even today Toi is a rather remote location. There are buses to Toi from Shuzenji station (47-55 minutes) and it's about three hours by car from Tokyo. A more interesting and scenic way to approach the town is on the ferry from Shimizu, on the other side of Suruga Bay. The crossing takes 65 minutes with spectacular views of Mt Fuji on a clear day. Although Toi's population is now only about 2,500, it has hot spring resort hotels and more modest minshuku accommodation, making an overnight stay easy. And, after panning for gold and enjoying the illuminated cherry blossoms, you, like the miners of old, may be ready for a nice hot soak! Vicki L Beyer, a regular Japan Today contributor, is a free lance travel writer who also blogs about traveling in Japan. See her blog at jigsaw-japan.com. i enjoyed your travel journal. I live in Toi. Thank you for your introduction to Toi.